Good morning people, once again I am trying to do the blog thing and this morning I am having to fight technology to do it. and the card they were designed for, and I didn't need all the pink ones, so now I have a dozen pink flowers to use, sometime, along with lots of other "sometime" use stuff. The rest of the desk has a lot of other 'sometime' stuff on the desk, but it really isn't very exciting. "they are very pretty, shame to part with them"
"get rid, you know you will never use them, you are so uncomfortable with stamping that you only ever use the same easy ones"
Anyway if you are visiting me, thank you for your time and effort, and suggest that you pop over to Julia's page where you will be able to snoop at far more interesting desk than mine. Regarding the sort-out, I'd sort them into definitely keeps and a pile of ones that you haven't used for the past year. If you haven't, you probably won't again. It's cathartic making space in your crafting life - and then you'll have room for something new. Grin!! Hi there. Well done on the card. Lovely. 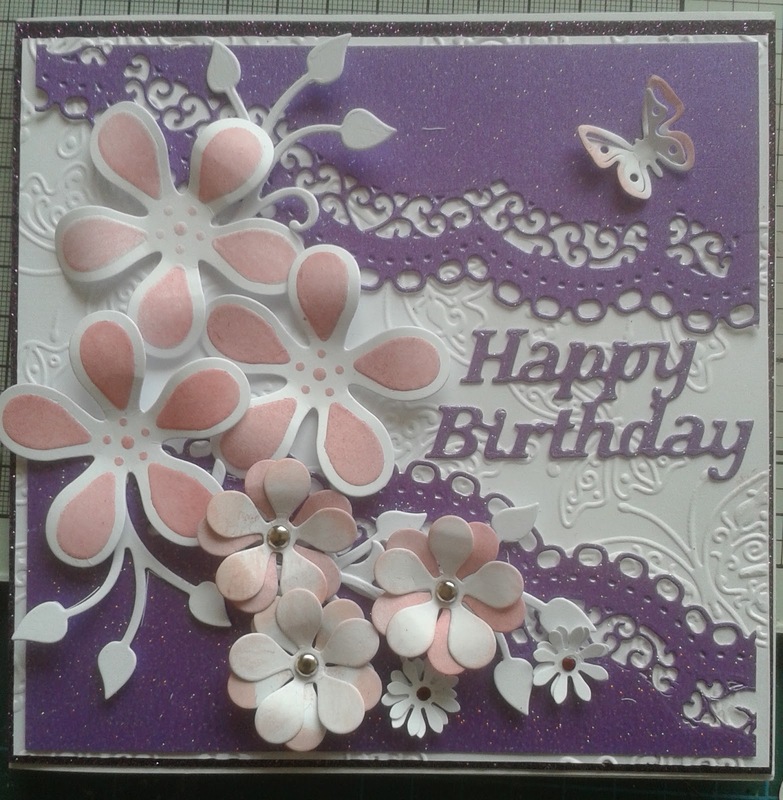 And all those spare flowers - why not make a 2nd card - but leave it generic until you know what sentiment to put on it? Or is that just a little too logical for my rapidly diminishing grey cells? Thanks for your comment - yes - I'm talking to Serif about the pictures!! Hopefully I can sort it when I've a few more mins. Will we see you on Saturday for the team feedback meal?? Your card is beautiful! I'd be happy to take those stamps off of your hands, ha ha! Not sure if you get notification of reply so i will put it on here and on you site. 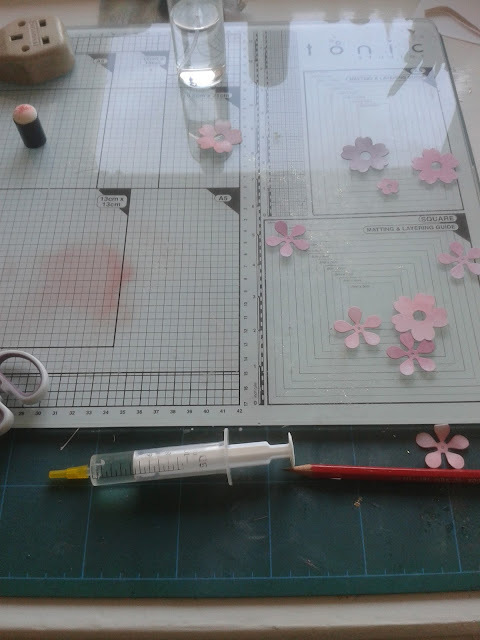 The pink was a mixture of Victorian velvet and Tattered lace as I couldn't find the colour I want either.